Almost Home offers a wide variety of Los Angeles, CA corporate housing options for every short or long term furnished apartment need you may have. Contact us today to receive a temporary housing quote customized just for you in your desired area of the city. We wish to help familiarize potential newcomers to Los Angeles and therefore provide the following informative summary of various aspects of this city. Take a few moments to acquire the local information of a long-time resident before you arrive. Those staying in corporate housing in Los Angeles, CA for business reasons might appreciate some information about the city’s business condition. Long Angeles has a diverse economy built on international trade, entertainment, fashion, law, healthcare, and tourism. Its GMP (Gross Metropolitan Product) is around $1 trillion annually, making it one of the largest in terms of GMP. It is even larger than more than half the world's sovereign countries. Manufacturing is one of the most important aspects of LA's economy and it is one of the West's largest. Companies like Reliance Steel and Occidental Petroleum are based here, just to name a few. It is also a major city for entertainment production, with Hollywood being part of the City and Burbank close by. There are large studios that are still used for scenes here and many of the post production companies still call LA home. Television production is more prevalent here than movies. Music as well as video games production is also prevalent here. Other Fortune 500 companies include Tutor Perini, Health Net, AECOM, and CBRE Group. International companies like 20th Century Fox, American Apparel, Pizza Kitchen, The Capital Group, Capstone Turbine, The Cheesecake Factory, Cathay Bank, City National Bank, The Coffee Bean & Tea Leaf--all have their international headquarters. Knowing what clothing to bring with you to your Los Angeles, CA furnished apartment is somewhat dependent on the local climate. Los Angeles experiences Mediterranean climate with sunny summers and mild winters. Spring is mild with temperatures between 68°F in March and 74° in May. Summers warm up to a peak of 83°F in July. Fall temperatures reach average highs of 68° in October, then cools marginally to lows averaging 50° in November. Winters are mild, stretching from December to January with lows in the 40s. So, be sure to dress according to the climate of the time of year and then venture out of your Los Angeles, CA corporate apartment to enjoy the wide variety of outdoor activities that this area offers. 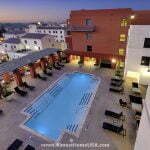 Being a temporary resident in Los Angeles, CA corporate housing need not doom you to feeling like a complete outsider. Acquaint yourself with Los Angeles’s history by reading our brief historical summary provided below. The area supports archeological evidence of human civilizations as far back as 10,000 years in the Los Angeles area. The different tribes, cultures and people that have been here have changed over time and one culture has replaced the previous successively in that time. The most recent history includes the Tongva and Chumash tribes, just prior to the European colonization, led by the Spanish Empire. When the Spanish arrived, they were led by Juan Rodreguez Cobrillo, a Portuguese, and his exploration gave way for the Franciscan missionary Juan Crespi in 1769. This mission was host to another group of settlers that eventually named the town, Pueblo de Nuestra Senora le Reina de los Angeles. In English, it was the Town of Our Lady the Queen of Angels, a Spanish reference to the Virgin Mary. Soowon Galbi KBBQ Restaurant on S Vermont Ave Ste C: Sowoon is a popular Korean restaurant featuring an extensive BBQ menu alongside authentic Korean favorites. Some of the BBQ items are even flamed over a charcoal fire giving it an authentic flavor. The bar serves a small selection of local and imported beer and limited wine. The restaurant is spacious, yet crowded on weekends. Try the Galbi. Angelini Osteria ON Beverly Blvd: Angelinia traditional Italian restaurant, serving some of the old-school Italian favorites found in the small cities and kitchens in old Italy. The menu is extensive and each dish is cooked fresh. The restaurant is designed to be laid back and for patrons to take their time from appetizers to their delectable desserts. Try the Porchetta Leg of Pork Roasted in the Wood Oven, it is a favorite here. Also try the Pizza Margherita with Andouille Sausage. Bottega Louie on S Grand Ave: This is an inexpensive Italian restaurant serving the usual favorites. There is free Wi-Fi and a well stocked bar. Happy hour is crowded here and famous for its Mimosas and Bloody Marys. Try the Weekend Brunch that is immensely popular with the locals. Providence on Melrose Ave: Province is noted for its exquisite seafood selection, caught fresh daily and prepared with the freshest herbs and ingredients. It is a quite venue that is priced above average. Servings are larger than average too. The romantic ambiance adds to the delicious menu. They have a full bar and cocktails are popular here as well. Most patrons start with happy hour and follow with a long dinner. Try the Nancy's Day Boat Scallop. Craft on Constellation Blvd: Crafts serves lunch and dinner in a simple environment. They have a full bar with beer, imported wine and cocktails. They have an extensive appetizer menu that works well with the cocktails and beer menu, which include drafts and craft bottles. The dinner menu is also focused on seafood with little emphasis on vegetarian or vegan meals. Stepping out of your Los Angeles, CA temporary housing is bound to present you with numerous interesting activities. We have listed a few possible entertainment options that may appeal to you. Museum: The Los Angeles County Museum of Art on Wilshire Blvd is stocked with more than 100,000 exhibits, making it one of the largest art museums in the west and a place not to be missed. They began in 1965, with an aim of preserving the culture and diversity of LA and the surrounding valley. The collection has evolved over the years, just as the composition of the populous and now includes a vast collection of Asian, Islamic, Latin and contemporary art. Theaters: The Walt Disney Concert Hall on S Grand Ave is a majestic theater filled with performances that stir the soul. From orchestras to opera, plays to skits and ballet, to contemporary dance, the repertoire here is as vast as it is elegant. Parks: Griffith Park on Crystal Springs Dr is one of the largest parks in the United States. It consists of 51 miles of expansive hiking paths and biking trails. It includes a zoo, a comprehensive botanical garden, and an amphitheater. There is even a 36-hole golf course. Whatever your reason for visiting Los Angeles, Almost Home Corporate Housing is your best choice to provide you with a furnished apartment in Los Angeles, CA that is perfectly suited to meet your unique housing needs. Call us today to receive a quote or fill out our simple housing request form at the top of this page. Marina del Rey: If you are living in a Marina del Rey furnished apartment then you won’t be using the fully equipped kitchen very often. The reason is because Marina del Rey has the second most amount of restaurants per square mile of any city, town or CDP in the country with the exception of New York City. If you’re looking for Marina del Rey corporate housing, make sure that it’s within walking distance of shops and restaurants. Santa Monica: The heart and soul of Santa Monica are in its shoreline. You could argue that the essence of this beautiful seaside town is in the art of film, or in the glamour of celebrity, but in fact it is the views of the Pacific Ocean that charm the traveler again and again. So if you’re looking for a furnished apartment in Santa Monica, ask for one with an ocean view. Westwood: What makes Westwood so lovable, aside from the college town atmosphere and the film premieres, is that it is so walkable. Home to UCLA, Westwood is young, exciting and glamorous. It is also one of the safest and most affluent neighborhoods in Los Angeles, and it will bring out the wanderlust in you. If you’re living in corporate housing in Westwood, leave the heels at home and bring a sturdy pair of walking shoes. You’ll want them as you wander home from dinner or a lecture, window-shopping all the way. West Hollywood: West Hollywood is socially conscious, liberal, and pet-friendly. It was the first place in the country to adopt a mandatory green building ordinance. West Hollywood even goes so far as to restrict the local government from doing business either directly or indirectly with any country known to violate human rights. If you’re looking for a pet-friendly area in Los Angeles, look no further than West Hollywood. The neighborhood is home to 1,000 dogs per square mile. So if you’re staying in a furnished apartment in West Hollywood, bring your most liberal politics and a canine companion. Woodland Hills: A genteel suburb of Los Angeles, Woodland Hills is replete in historic homes and features many cultural events. In the early part of the twentieth century, 120,000 eucalyptus, sycamore, fir and pine were planted by a developer. Today these nearly one hundred year old trees add a sweeping grandeur to the city. Woodland Hills corporate housing is an excellent place to put down roots. Redondo Beach: If you love to surf and sun yourself, make Redondo Beach furnished apartments your home. The Strand runs along the coast here all the way up to Santa Monica and is the perfect place for an afternoon stroll or bicycle ride. You could also join in one of the many beach volleyball games. Corporate housing in Redondo Beach is meant to free up time so that you can enjoy the beautiful Southern Californian weather. Long Beach: For the budget-conscious, for the world traveler, and for the xenophile, Long Beach is the perfect place for a temporary stay. Here in one of the busiest shipping ports in the world there is a cacophony of languages, and also there are a plethora of ethnic dining options. If you’re living in a furnished apartment in Long Beach, you can expect your surroundings to be every bit as luxurious as corporate housing will be in other parts of Los Angeles, but the rate will be lower than a stay in, for example, Marina del Rey or West Hollywood. 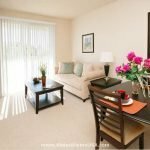 Whether you’re only in Los Angeles on a temporary business assignment, or whether you are relocating to the city permanently, furnished apartments are the best option for short term leasing. Living in corporate housing in Los Angeles means that you will have more free time to explore the many neighborhoods and cultural events for which the city is famous. Check out these seven neighborhoods and I’m sure you’ll be quick to agree that they are some of the finest that Los Angeles has to offer.